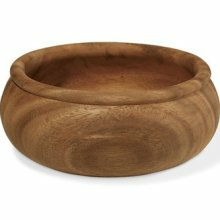 Wood serving bowl isn't complete without matching individual bowls. Made of Acacia wood which is not harvested from rain forests. Hand wash only, avoid soaking. Measures 6 1/4" in diameter.